Furnace Creek is one of three tourist centers within Death Valley National Park. It is home to the Park's visitor center, a pair of hotels, a museum, shops and restaurants. 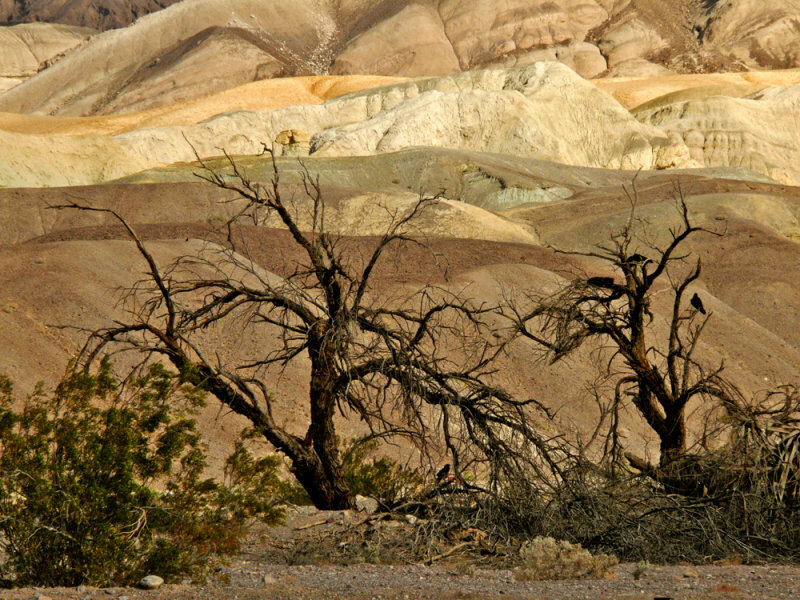 An oasis on the barren valley floor, Furnace Creek originally provided crew quarters for borax miners. Visitors to Furnace Creek are always reminded that they are in the heart of Death Valley -- I made this telephoto image from the parking lot of the Furnace Creek Ranch Inn. The first layer is a screen of gnarled trees housing at least three large ravens at the moment. It is backed by four layers of differently colored ridges of barren rock that stack upon each other from the bottom to the top of the image. It is very much the essence of Death Valley itself -- a barren, hostile landscape, yet often beautiful and surprising. There is great beauty and much variety to this desert. In fact, Death Valley did not seem to be a desert to me, except on the dunes. Most of it is hilly, rocky country spread across an old sea bed. And yes, it is dangerious, haunting, mysterious, and extreme, a shock to the eye and to the senses. I find this speaks to those who've never experienced what beauty a desert environment can offer. We often think of deserts as the barren, dry, and deadly expanses seen in old spaghetti Westerns. In this image the undercurrent of danger is obvious and to be heeded, but you've augmented that danger by including the subtle color variations and gentle undulating hills that give the desert a beautiful and austerely haunted quality.